Everyone has to eat. But by no means does everyone have the time and opportunity to conjure up delicious meals from fresh ingredients. So what can be done when hunger calls for hearty meat dishes that taste just as good as Mama’s great Sunday dinners? Of course, we offer our meatless variations for all those who do not like meat, but do not want to pass up the delicious dishes from Simon. Here are some things worth knowing about Simon and other interesting facts. Many of our favourite dishes from classic cuisine take a lot of time and work to prepare, so they tend to make rather rare appearances on household meal plans. 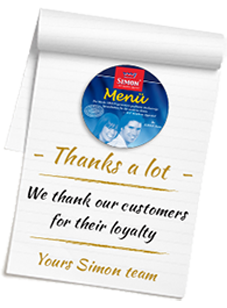 “Convenience” is the word commonly used today when the meal comes to the table so quickly and deliciously as the dishes from SIMON. As a side to our classic aspic, we recommend tasty fried potatoes with caramelised onions and home-made rémoulade. Quality has a name. That’s right — “SIMON”. We have firmly established our name on the market through the high standards we have set for our products and the related quality, and our success is reflected in a number of awards. Naturally, we do not want them to be the last ones!